If you didn't have a chance to attend SharePoint Saturday Houston on April 9 or if you had planned to attend my session at SharePoint Saturday San Antonio on April 2, and were disappointed I was not there (sorry, family emergency), or if you just want to learn more about Office Delve, here's my presentation. The organizers of SharePoint TechFest Houston (#HoustonSPTF ) held Oct. 24, 2015 at the Reliant Center, did a great job of putting together a fantastic event. I love to learn new things and I found the presentations I attended on "Creating a Great User Experience in SharePoint" by MVP Marc Anderson (Marc Anderson's Blog) and "Self-Service Business Intelligence for On-Prem Organizations" by my friend, Theresa Eller (Theresa Eller's Blog - SharePoint Madam) really did the trick for me. I also want to thank all the speakers whose presentations I wasn't able to attend. Some of them posted their presentations on the event site The house was packed and I heard nothing but good things from the attendees I talked to. This year, I also had the pleasure of being one of the presenters at SharePoint TechFest. This is only my third SharePoint public speaking engagement and my audience on Tuesday was the largest yet with all the seats filled and some people standing along the wall in the back. I want to thank all the attendees for baring with me through a few rough patches and not throwing things when I whipped through a couple of my slides with lightning speed. Over the next few weeks, I plan to blog more in-depth on some of the topics I covered, but for now, I'm posting the slides from my presentation. Also, if you missed my talk at TechFest, I'll be presenting it again with some new material at the Houston SharePoint User Group meeting (H-SPUG) on Nov. 18, 2015. 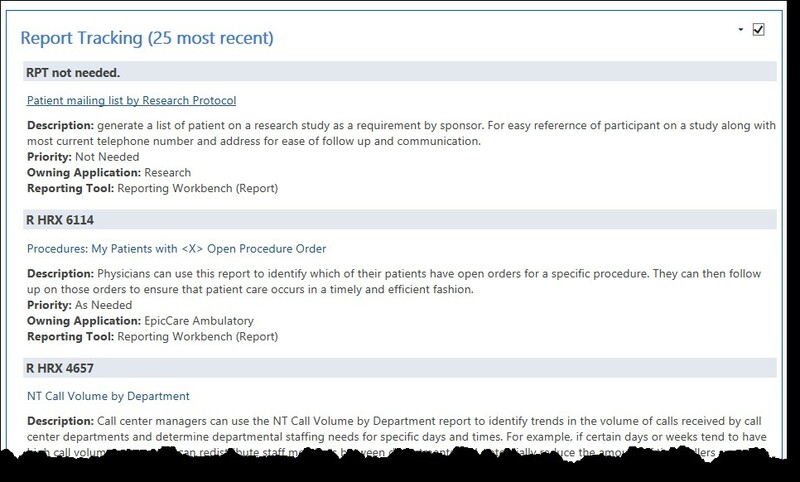 A Content Query Web Part (CQWP) can be used to rollup information from other locations within the same site collection. For example, you can use this web part to display list items from a list in a sub-site that is a sibling of the current site. Or, you could use it to display all calendar items from sites within the site collection. Out-of-the-box, this web part includes several preconfigured views and formatting options. But, what happens when you need to customize how information is displayed? This article walks you through the steps of customizing the CQWP web part to add additional list fields and labels to the web part output. 1. 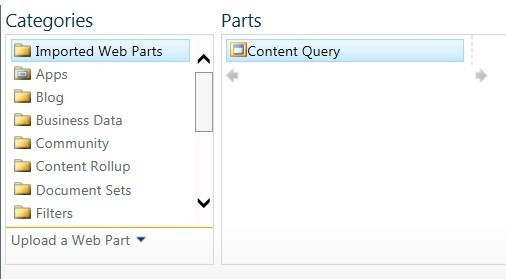 Start by creating a new page and adding the CQWP web part to the page. 2. Next, from the web part menu, select Export … and save the web part to your desktop. 5. 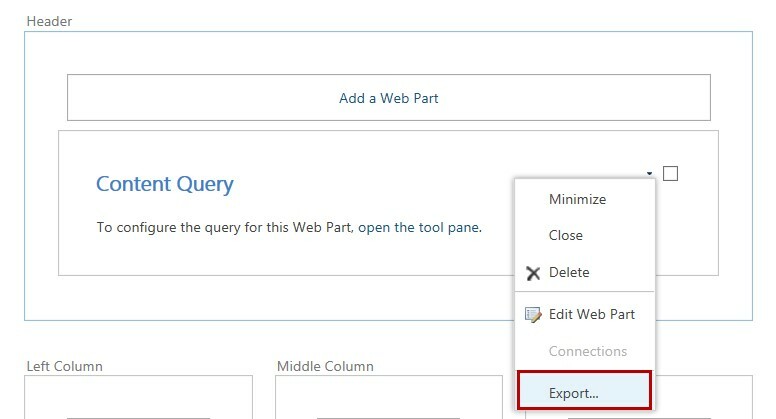 Delete the existing web part from your page and upload the new custom web part by selecting Upload a Web Part and then clicking the Upload button. 6. The customized web part will appear under Imported Web Parts. Add the new custom web part to the page. 7. The next step is to create a custom style sheet to add extra slots to the web part. To do this, open the site collection parent in SharePoint Designer and navigate to All Files>Style Library>XSL Style Sheets. 8. Create a copy of the ItemStyle.xsl stylesheet and rename it CustomItemStyle.xsl (this is the name we assigned in Step 3). 9. 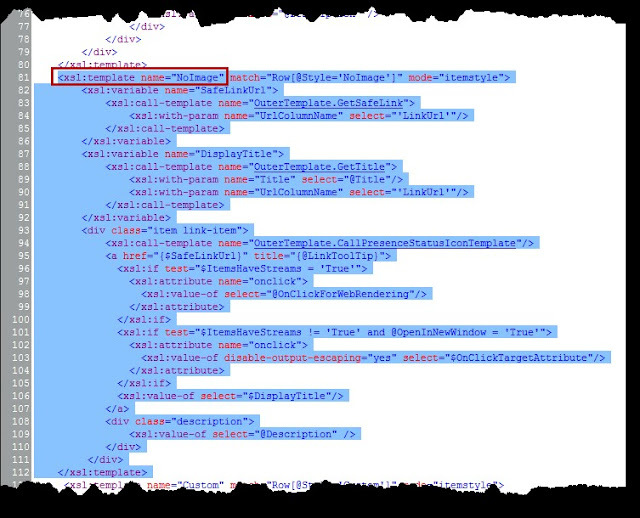 Check out the CustomItemStyle.xsl and open it as XML from SharePoint Designer. There are several different styles preconfigured in the web part. Determine which style is most similar to the look and feel you wish to achieve and then look for the name in the xsl:template name tag. Most of the names are similar to the menu options under item style in the CQWP Presentation section. In this example, I will copy the Title and Description template, which is named “NoImage”. (I know? Right? This makes no sense. But, here’s a hint, the templates in the style sheet appear in the same order as the choices on the web part menu). 10. Now, copy everything between the <xsl:template></xsl:template> tags and paste it after <xsl:template>. We will now modify the copied template section to add a new Item Style option to the web part menu and to add “slots” to the Fields to Display section of the web part. 13. Now, we are going to add slots to the Fields to Display area. Copy the Div class for description and paste it under the </div> closing tag. 14. Repeat step 13 for each additional slot that is to be added. 18. Save the file and check it in. 19. Now return to the page where you added the CQWP and refresh the page. Next, edit the web part. The new template should appear on the list of Item Styles and the new slots should be in the Fields to Display section. 20. Select the new Custom template from the Item Style menu and then add the internal field name of each field you wish to display followed by a semi-colon in the new custom field slots. 21. 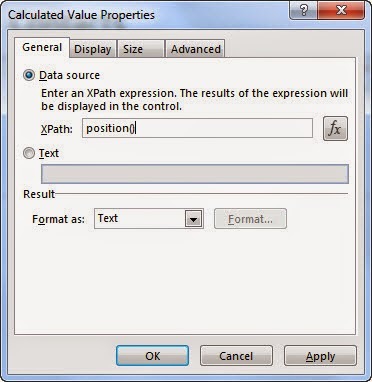 Set other formatting options as desired, then click Apply and OK.
22. In the following screenshot, items were queried from a list in a sibling site to the current site. 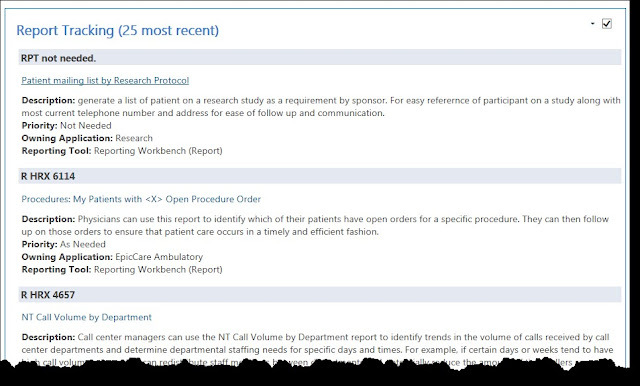 Presentation was set to group items by the “Report Repository ID” field and items were sorted by Created date. The Banded Group Style was selected and the Custom Item Style was selected. The built in Title and Description slots were used and three custom columns were populated in the new slots added to the style sheet. In my last post, I explained how to add items to the default service connection group (Application Proxy Group) for a web application by using PowerShell. I also described how to use the [custom] group to create application proxy group specific to a single web application. In this post, I'll walk you through the process for creating a custom service connection group that can be reused for multiple web applications. For example, you might want to have a Projects Group in addition to the default connection group. Run the SharePoint 2013 Management Shell as an administrator. $New = New-SpServiceApplicationProxyGroup -Name "My New Group"
Copy the Id of each service application proxy that you want to include in your new connection group and add it to a text file with the values separated by commas. Your connection group is now added in Central Administration and can be assigned as desired. Remove-SpServiceApplicationProxyGroup -Name "<friendly name in quotes or id of your group"
Both of these command require confirmation before executing. 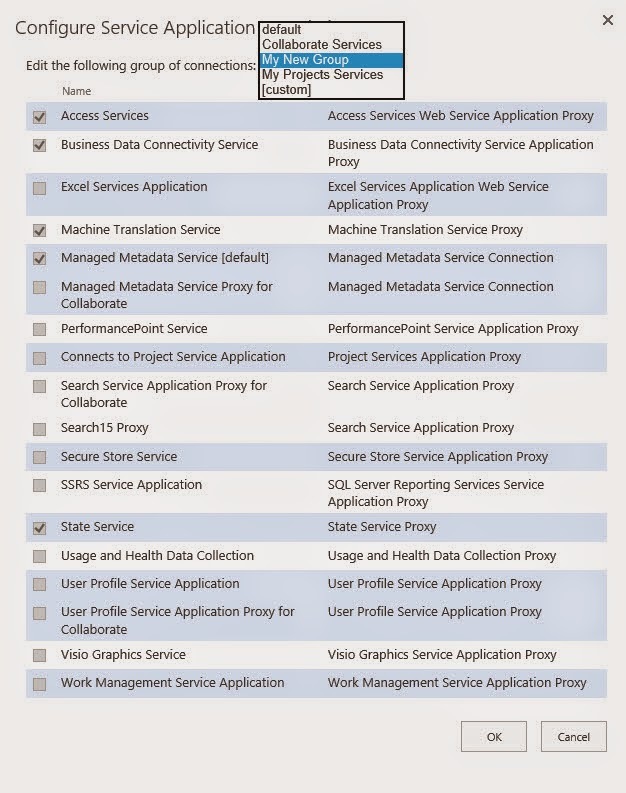 A sometimes overlooked features of SharePoint 2013 is the ability to create custom Service Application Proxy Groups for individual web applications. You can use this functionality to specify which of your service applications will be available for each of your web applications. For example, you might want to have two search service applications with different configurations and make one service application only open to your external facing web application and the other available to all your other web applications. From Central Administration, you can see the connection groups under the web application settings (Application Management>Web Applications>Manage Web Applications) by selecting a web application and clicking Service Connections from the ribbon. 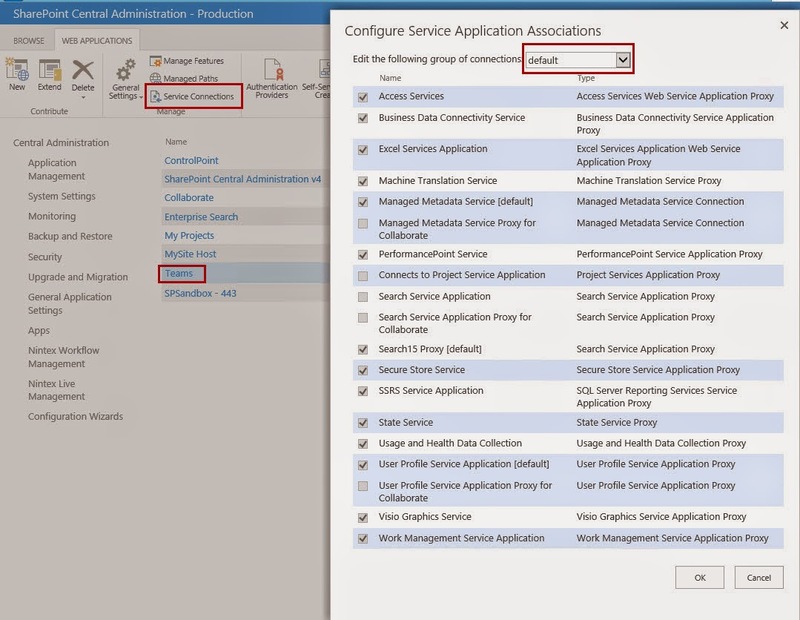 Out-of-the-box, you will see that a single instance of each service application you have created has been checked and added to the default connection group. You will notice that you are not able to change the members of the default proxy group using the Central Administration GUI, but you can select [custom] from the dropdown menu at the top of the window and create a custom proxy group for your web application. You can also use PowerShell to create additional custom proxy groups (more on this in my next post). But, what happens if you want to change the default group? The default proxy group cannot be changed through the Central Administration GUI, you need to use PowerShell. You can check your results by reopening the Service Connections window in Central Administration. You should see the proxy groups you added with a check in the checkbox next to the item. Items that have been removed will be unchecked. Recently a user on one of our SharePoint 2013 sites attempted to create an Access 2013 App on their team site and the installation failed because Access 2013 Apps had not been configured on the farm (more on configuring Access in a future blog). Annoyingly, after the failure the grayed out installation icon remained with an intimidating "Sorry, something went wrong with adding the app. Click to retry." message. Clicking the "Click to retry" link didn't help, but the message changed to "Sorry, something went wrong. Please refresh the page and try again." Of course you can imagine what happened when I refreshed the page ... back to square one. Logon to your SharePoint application server. Run the following commands to identify the GUID of the instance that needs to be deleted. Identify your app and copy its ID. If the app was uninstalled successfully, you will see the response below in PowerShell and the grayed out icon will disappear from your site contents page. I hope this helps you out and keeps your customers happy!